So you apply your primer and foundation, and partway through the day, you notice that your foundation looks weird. So you run screaming to the Internet, and Google tells you a bunch of stuff like “use products that have the same base” and “don’t put the water-based things on top of the silicone-based things.” But how can you tell what base your products have? You don’t have a chemistry degree; you just want to look gorgeous. Don’t panic, because I am here to help. By the end of this post, you’ll be able to figure out what base your products are. 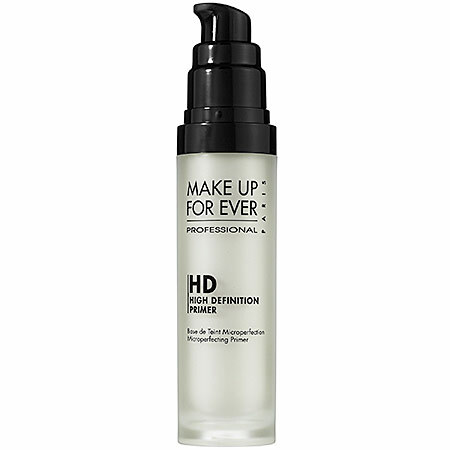 MAKE UP FOR EVER HD Microperfecting Primer Ingredients: Aqua (Water), Dimethicone, Trisiloxane, PEG-12 Dimethicone, Dimethicone/Vinyl Dimethicone Crosspolymer, Methylpropanediol, Butylene Glycol, Pentylene Glycol, Hydroxyethyl Acrylate/Sodium Acryloyldimethyl Taurate Copolymer, Squalane, Glyceryl Caprylate, Lauryl PEG/PPG-18/18 Methicone, Phenoxyethanol, Ceteth-10, Laureth-4, Ethylglycerin, Panthenol, Potassium Sorbate, Polysorbate 60, Parfum (Fragrance), Argania Spinosa Extract (Argania Spinosa Kernel Extract), C12-14 Pareth-12, Hydrolyzed Algin, Dodecene, Sorbitan Isostearate, Isostearyl Alcohol, Laminaria Digitata Extract, Polyaminopropyl Biguanide, Tromethamine, Biosaccharide Gum-1, Sodium Cocoyl Glutamate, Sodium Hyaluronate, Carbomer, Hexyl Cinnamal, Benzyl Salicylate, Limonene, Butylphenyl Methylpropional, Linalool. [CI 19140 (Yellow 5 Lake), CI 75470 (Carmine), CI 77007 (Ultramarines), CI 77288 (Chromium Oxide Greens), CI 77289 (Chromium Hydroxide Green), CI 77491 (Iron Oxides), CI 77492 (Iron Oxides), CI 77499 (Iron Oxides), CI 77742 (Manganese Violet), CI 77891 (Titanium Dioxide)]. Photo and ingredients list taken from Sephora website. 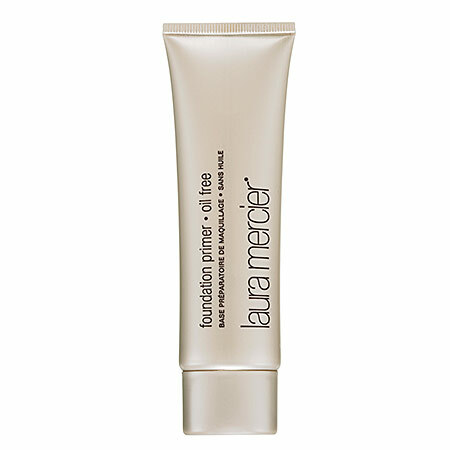 Laura Mercier Foundation Primer – Oil Free Ingredients: Water (Aqua), Ethylhexyl Palmitate, Stearic Acid, Isodecyl Isononanoate, Glycerin, Caprylic/Capric Triglyceride, C20-22 Alkyl Phosphate, C22-20 Alcohols, Squalane, Butylene Glycol, Cetyl Esters, Phenoxyethanol, Boron Nitride, Silica, Cetearyl Alcohol, Sodium Hydroxide, Allantoin Tocopherol Acetate, Ascorbyl Palmitate, Hamaelis Viginiana (Witch Hazel) Extract, Cucumis sativus (Cucumber) Fruit Extract, Cymbopogon Schoenanthus Extract, Camellia Sinensis Leaf Extract, Hydroxyethylcellulose, Retinyl Palmitate, Dimethicone, Polyamino Sugar Condesate, Hydroxyethyl Acrylate/Sodium Acryloyldimethyl Taurate Copolymer, Chlorphensin, Benzoic Acid, Polysorbate 60, Polymethyl Methacrylate, Saccharomyces/Xylium Black Tea Ferment, Methylparaben, Propylparaben, Ethylparaben, Butylparaben, Isobutylparaben, Potassium Sorbate, Green 5 (CI 61570), Yellow 5 (CI 19140). See how there are no -cone/-methicone or -siloxane words near the top of the list? That means that it’s water-based. This primer does contain dimethicone, which is a silicone, but it’s very low on the list, which means that it contains a very small amount of silicone. Thus, because this primer contains much more water (and other ingredients) than silicone, it is water-based. 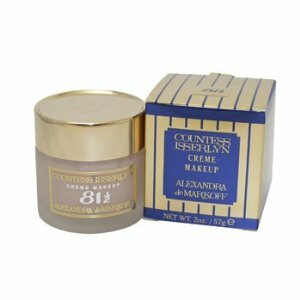 Photo from Amazon.com; cannot find where I got the ingredients list. Yes, water is listed as the first ingredient, but that is to keep the product more blendable. The second and third ingredients (in bold) are definitely oils. Phew! You don’t know how many ingredients lists I went through to find that! I swear unicorns are easier to find! They are unlikely to be of concern to you because chances are you’re not using an oil-based foundation (if you are using an oil-based foundation, check your closet for a herd of unicorns). They seem to work best with oil-based primers. Good luck finding one. This rule (i.e. -cone/methicone or -siloxane words near the top of the list indicate a silicone-based product) generally applies for viscous products. 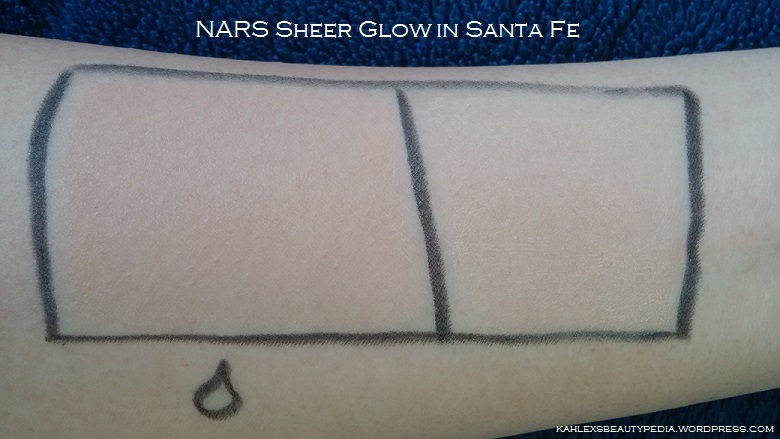 NARS Sheer Glow, for example, is an exception, as it is an exceptionally runny product. 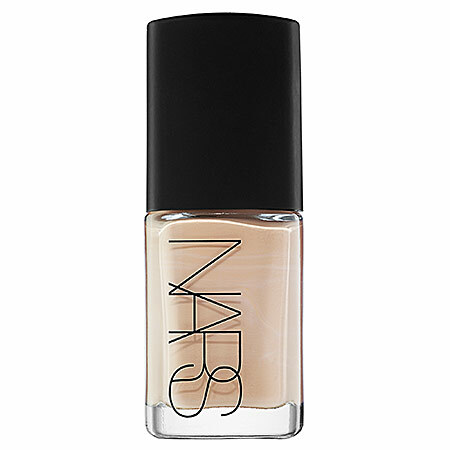 NARS Sheer Glow Ingredients: Aqua (Water), Cyclopentasiloxane, Butylene, Glycol, Glycerine, Polymethylsilsesquioxane, Dimethicone, Dimethicone/vinal Dimethicone Crosspolymer, Triethylhexanoin, Peg-10 Dimethicone, Dis-butydimethicone Polyglyceryl-3, Disteardimonium Hectorite, Sodium Glutamate, Sorbitan, Sesquiisostearate, 1-Methylhdantoin-2-imide, Phenoxyenthanol, Sodium Dehydroacetate, Triethoxycaprylylsilane, Polusilocone-2, Serralysin, Curcuma Longa, Glycuosyl Hesperidin, Ascorbyl Glucoside, Tocpherol, [+/- (may contain): CI 77891 (Titanium dioxide), CI 77492 (Iron oxides), CI 77491 (Iron oxides), CI 77499 (Iron oxides)]. 1. Spread a silicone-based primer on the back of your hand or somewhere on your arm in a thin, even layer. With primers, it’s much easier to tell if it s silicone- or water-based. 2. Apply a small amount of foundation over the primer. First of all, yes, the foundation is too dark for the underside of my forearm. It matches my face, though. Second of all, yes, that is kind of a crappy rectangle. I never claimed to be an artist. Anyway, you can see that on top of the water-based primer, NARS Sheer Glow looks like it blends into the texture of my skin perfectly. On top of the silicone-based primer, it’s started to pill off and it looks kind of like powder just sitting on top of my skin. This is what happens when you use a water-based foundation on top of a silicone-based primer. Also, you could test it on your face, but I think it’s better to test on your arm so that if you do end up using a water-based foundation on top of a silicone-based primer, you don’t have to walk around all day with your face looking like the right portion of the box above. You want water-based primers with water-based foundations (or tinted moisturizers, BB creams, CC creams, concealer, or any other base products; I’m just going to keep typing “foundations” for the sake of brevity). It’s similar to the way that oil and water do not mix. The two different bases (water and silicone) do not mix well and can cause your foundation to pill. In particular, using a silicone-based primer with a water-based foundation causes the foundation to pill because the primer creates a silicone barrier. When you try to apply a water-based foundation on top of that, the silicone “repels” the water from the foundation and does not let the water in the foundation soak in the way that a water-based foundation needs to in order to blend into the texture of your skin. In my experience, using a silicone-based foundation on top of a water-based primer does not result in the same problem, because the water in the primer absorbs into your skin and the foundation is able to apply easily on top of it. Where does your moisturizer/sunscreen fit into all of this? Give your moisturizer time to absorb fully, meaning your skin should no longer have that “tacky” feeling that you have right after applying moisturizer. If you use sunscreen (which you should, regardless of whether it’s sunny outside), you need to let that absorb as well. The base of your moisturizer/sunscreen is irrelevant, because if you allow them to absorb completely, they will not affect makeup application at all. If you begin applying primer and foundation before your moisturizer and/or sunscreen has fully absorbed, they can cause your makeup to break up sooner, which is the opposite of what you want. If you don’t want to have to wait for your moisturizer and sunscreen to absorb (for whatever reason), then look for products that absorb quickly. Alternatively, blot your face before you start applying your primer. Similarly, your powder is irrelevant to the base of your foundation/primer. There is no such thing as a water-based powder (it wouldn’t be a powder). If your powder isn’t working with your foundation/primer and giving you the look that you want, it is not related to the base of your foundation/primer. Please remember that using two products with the same base doesn’t necessarily mean that the products will work for you. Not every product works for every person. You may need to experiment to find the right combination for you. I highly recommend asking for samples, as they are a much cheaper (i.e. FREE) method of trying out a product. You can ask for samples of any product that can be sanitized and put in a small sample jar, such as primer and foundation. I hope this post has been helpful.I know that the whole issue of silicone- and water-based products can make one feel overwhelmed. Fortunately, you don’t need to be a chemist to discern the difference. Feel free to leave comments, questions, and feedback.